A finished custom quilt (and picture post)! It's been great sewing weather this week, cold and rainy. Autumn. My favorite season. Although the overcast and grey conditions are not so good for my photography skills, or lack thereof. It has also been a week of testing my sewing skills. My Bernina (820) which I use for all of my piecing and quilting - and rely upon - has gone to the workshop for much needed repair and service. The backup Juki came out of the closet and had to step up to the plate. The Juki is a straight stitch only machine and an absolute workhorse. I have LOVED sewing with it! Even the quilting was a breeze once I realized that a simple adjustment of the presser foot pressure was all that was needed to solve the feed problems. It feels like I have passed a sewing skills test. This custom quilt measures approx 46 inches x 46 inches and has been backed with Robert Kaufman Kona Cotton in Chartreuse. I've quilted a grid of horizontal and vertical (double lines) lines as well diagonal lines intersecting in the center of each block. 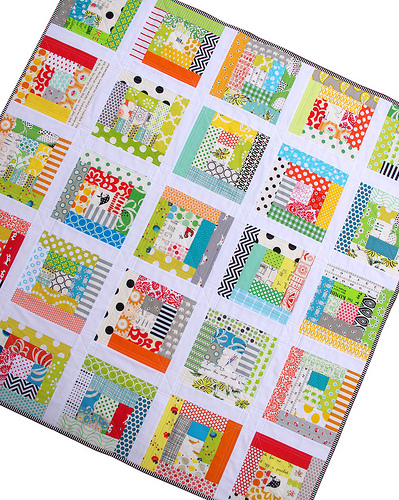 Many of the fabrics in this quilt are from my scrap bin, but I have also added fabrics from stash to ensure a balance of colors (with a hint of citrus-y colors as requested) and prints. I have used a black/white stripe fabric for binding, the same as the original Scrappy Log Cabin Quilt. This quilt is ready for shipping! I am already planning my next project. Maybe a tidy-up is required before I start pulling out more fabric. Gorgeous quilt Rita, great colours and I love the quilting you have done. I'm always amazed at how you never seem to have lingering WIPs. You finish everything you start. Very inspirational. Ps- the quilt is beautiful! I love the fussy cut centers. Especially the little girl! It is, of course, a lovely quilt, what a lucky recipient.. I was wondering how you were getting on with the Bernina 820 as I hanker after one myself but it's a lot of money of course, and I;ve heard vague good and bad things. I'd love to hear if you think it's worth it and what is good about it (or bad!) I have a Pfaff Grand Quilter, very similar to your Juki and straight stitch only, which is fab, such a solid workhorse for quilting. Sometimes though, I too have problems with the feed and feel even with a walking foot, it gallops ahead somewhat. Would you mind sharing what settings you use on your Juki, in terms of the pressure, stitch length and thread tension? I'd be really grateful. lovely quilt....love the back and the front....cheerful for your autumn and equally as cheerful for our constantly rainy spring....thank you! Wow is all I can say, okay I love it too! Love the happy colors in this quilt. 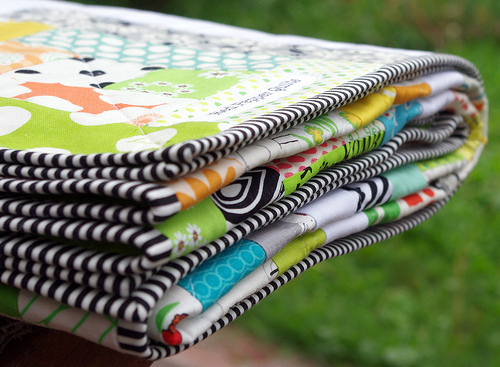 Scrappy quilts are some of my favorites. The pattern and quilting on this one is lovely. 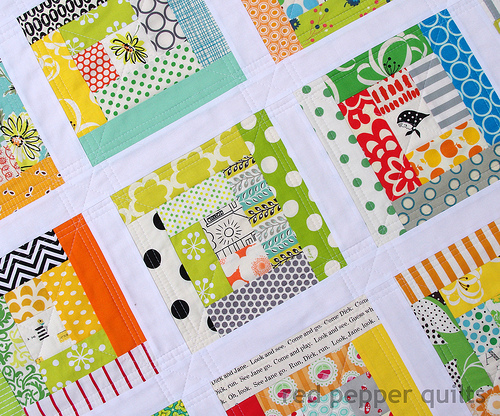 Love the bright and cheeriness of this quilt! Excellent...as always! This is a happy quilt. 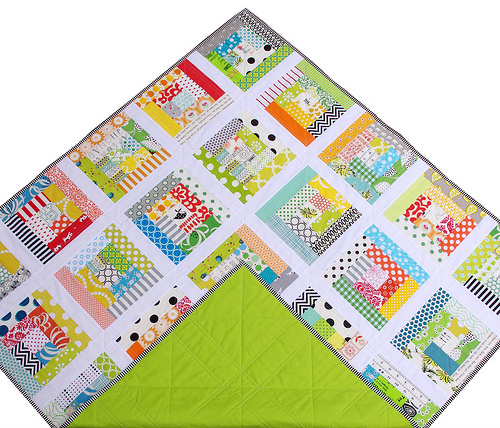 Such a fun and happy quilt Rita, they will love it.I love how the white sashing frames all the scrappy logs making ech one a light jewel! What a sunny quilt! I, too, really like the white sashing that sets off all of the blocks! A beautiful quilt, as always, Rita!! And don't knock your photography skills - your pictures are always great and show off your lovely quilts splendidly. Its one of the many reasons I love your blog. So fresh and fun, Rita! Love the quilt. Such pretty colors. I just purchased a Juki TL2000Qi and Love it. I needed a work horse for sewing / quilting. Rita, You made a wonderful quilt, whoever gets it is a lucky person! Your quilt is so very beautiful! Well done! Beautiful log cabin. I have been considering that Juki. I've heard really good things about it! Hi Rita! I love this fresh coloured quilt. Just wondering what the black chevron fabric is? I would like to but some online but I cant tell the scale of the pattern. This one in the log cabin quilt looks like a nice size. I'm also wondering if you could say more about adjusting the pressure foot to help with the feed... The only machine I have is a 'workhorse' as you say and I do sometimes struggle with the quilting on it. Any tips would be VERY much appreciated!! I love this. Sooo happy and bright! Beautiful as always Rita. No surprise there. I'm really liking your quilt, but loving the color you backed it with. My question, when you double line quilt, do you sew each line separate or use a double needle? 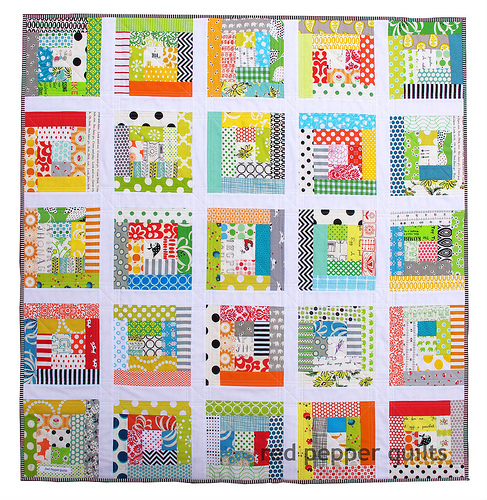 I really like the looks of the double line quilting and would like to try it on one of my own. On another note, I've just gotten a Bernina 820 (last month), a year old and am learning how to operate. I hope yours is home soon. so much fun and I love the color on the back! Another stunner Rita! Someone is going to be very happy. I too was wondering about the adjustment to your pressure foot. I have a Janome 1600p, which is very similar to the Juki. I usually have the pressure on 3, but sometimes it tends to pull the fabric a bit, and I notice it particularly when doing dense straight line quilting. It would be great to know if you increase or decrease the pressure on your machine. Thanks heaps! What batting did you use on this projects? Rita, your quilts are stunning! I just love them. I have an 820 also and would love to have a Juki too. I aspire to see and quilt like you. it's a beautiful quilt, rita! 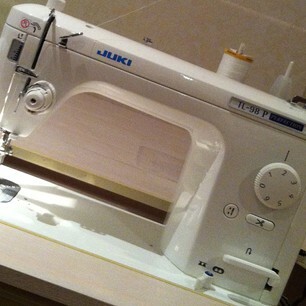 and hurray for JUKI sewing machines!!! aren't they wonderful??? a workhorse, indeed.